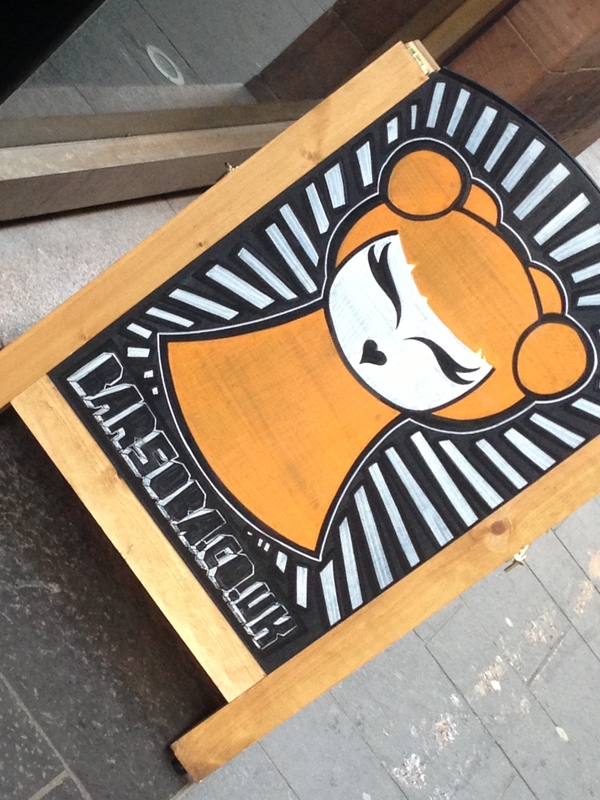 Soba, located on Mitchell Lane, is one of two in Glasgow, with the other being found on Byres road in the west end. Both venues are busting with bright, electric neon colours and try to bring the taste and style of South-East Asian street food to Glasgow. If we are out in Glasgow and in the mood for some great sushi or a big plate of Nasi Goreng, Soba would always be one of our first choices. We were interested to find out if their burger, which is the only one on the menu, could be as good as the food we’ve had there in the past. 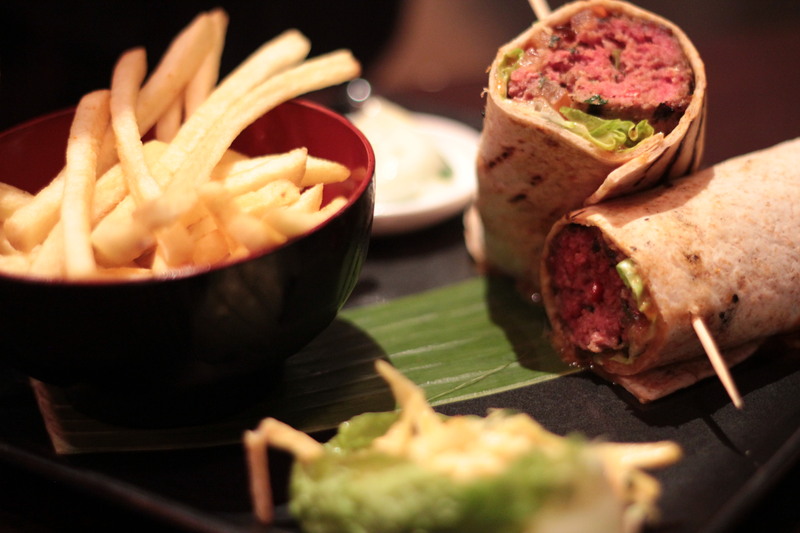 Described on the menu as a ‘ground steak burger infused with spring onion, chilli and lemongrass mayo in a roti wrap’, it may not be one that will please burger purists, but we certainly enjoyed it! The presentation was flawless, if a little more unusual than what we’re used to when it comes to burger reviews. The patty was served cut in half and was formed into almost an oval shape inside the wrap – at first it felt more like a minced steak hot-dog than a burger. The lemongrass mayo was served on a side dish, not infused with the patty as described on the menu and there was also a side of ‘thai slaw’ served on a bed of lettuce. Despite an usual presentation, taste-wise this was all burger-goodness. The patty was perfectly cooked, as you can see from the photos, with deep hints of pink throughout. It was juicy and the chillies and spring onion used to season packed a punch with each bite. The patty was very zesty and as vibrant as the neon red, yellow and green furniture that’s used to decorate the bar. The lemongrass mayo was also delicious, and I found myself using it to dip the burger into, much in the same way you’d dunk your Dominos pizza crust, making sure you absorb every last bit of mayo in the tub. Initially, I wasn’t a huge fan of the wrap, but it did hold the contents together well and was a light change from a burger bun. Before you ask, no, it’s no substitute for a good sourdough or brioche, but it was nice to try something a little different, and we’d definitely take it over the floured burger bun of doom any day of the week. As good as the burger was, for the price, there wasn’t an awful lot of it. With only a few bites, I had pretty much eaten the entire thing except for the fries, which weren’t all that great. I don’t think something like this would really work if it were any bigger; however, it was a tad on the expensive side. The patty was well cooked, even if it was a rather odd shape.. If you’re looking for a good burger, but are after something a little different, you won’t go wrong with the Bangkok burger. The excellent patty and creative presentation are only let down by quite a high price tag, given the portion size and poor, overly salty fries on the side. + Well cooked, well seasoned patty. 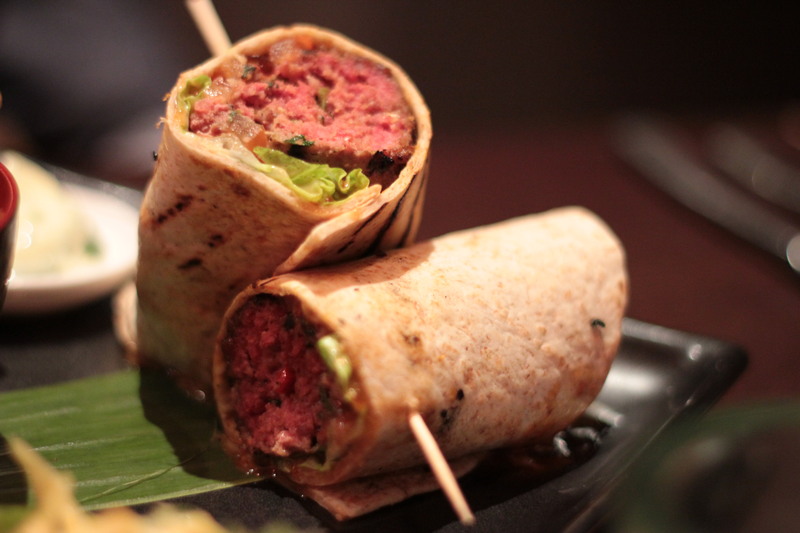 + The use of a wrap instead of a bun was a nice change, but probably won’t please burger purists. 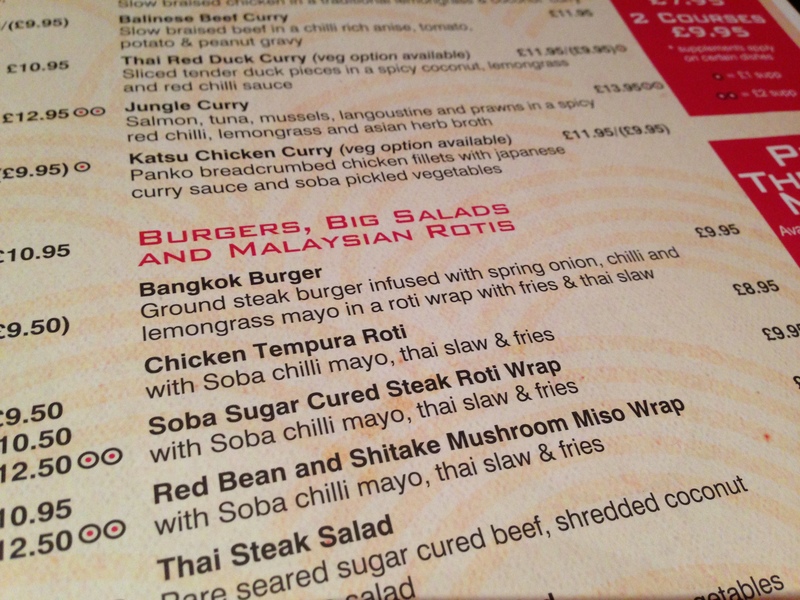 + The lemongrass mayo complemented the patty very well. It was seriously addictive. – Quite expensive for a fairly small portion of food. – Poor, overly salty fries.